Notes: The Robert Mueller Municipal Airport, named in honor of a City Council Member who died while in service to Austin, opened in 1930 with gravel runways. It closed sixty nine years later in 1999. Robert Mueller Municipal Airport was officially dedicated on October 14, 1930. 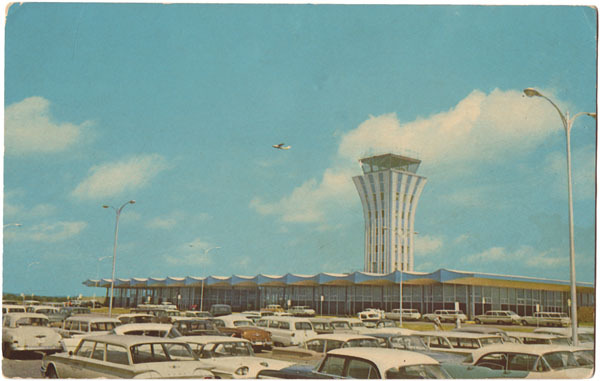 The main terminal building (pictured) was dedicated on May 27, 1961, and it was expanded in 1983. An addition known as the east terminal was dedicated in April 1990. Mueller closed to commercial airline traffic on May 22, 1999, and Austin-Bergstrom International Airport opened the next day, on May 23, 1999. Mueller continued to service general aviation traffic until June 22, 1999. The land Mueller once occupied has been retasked into what they are calling a mixed-use urban village. The development envisions "a district that would be a model for responsible urban development - an alternative to land-consumptive and automobile-dependant development patterns throughout the region that could influence the form and pattern of growth within Austin". City planners also hope it will play a positiverole in the revitalization of East Austin.